Early introductions help a puppy come out of her shell. You’ve dreamed of the day you could bring home a playful puppy who shows you plenty of love. But what if your puppy isn’t like that? Maybe she’s timid and wants to hide under the table all day. Don’t worry; you can get a shy pup to be more active. Introduce a shy puppy to new people, dogs and places. A good way to do this is on your daily walk. But you need to be calm and relaxed yourself if you expect your shy puppy to be that way too. If you tense up when another dog walker nears or when a kid on a bicycle rides by, your dog will likely pick up on your nervous energy and fear people and dogs even more. Keep your puppy on a short leash, close to you. If you really want to avoid an oncoming stranger or dog, instead of tensing up and pulling on the leash, calmly change the direction in which you’re walking. Socialize your puppy—introducing her to as many situations, animals and people as possible—during her first 12 weeks of life. During this time, puppies are naturally more social than fearful. Many puppies tend to be shyer around men and small children, for example, if they were not introduced to them during the first 12 weeks of their lives. You can still successfully introduce your shy puppy to new people and situations after 12 weeks; it just might take longer to get a positive reaction. Enroll your cautious one in puppy kindergarten—classes that help socialize shy pups. Ask your veterinarian whether your area offers these types of classes. “Students” learn to be comfortable around other dogs, different people, new places and strange sounds. Puppies also learn to deal with stress and new situations. 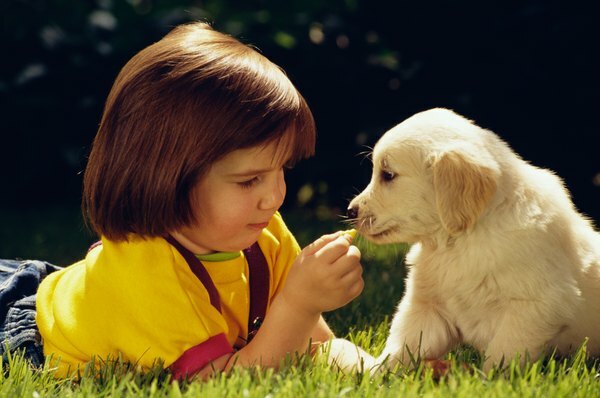 The puppy’s parent (you) learns about doggy development and how to prevent behavior problems. Keep your puppy around people instead of secluding her in a kennel or the backyard. This gets your pup used to the hustle and bustle of the house, including loud noises such as the vacuum cleaner, dishwasher and washing machine. Pick up your puppy at least once a day. Hold her in different positions, making sure you handle different parts of her body. Besides helping her become less shy, this makes it easier for you to perform grooming activities. Teach your puppy how to play by providing toys and playing with her. Let her go through “tunnels”—small cardboard boxes—and teach her to go up and down stairs. If you’re friends with the neighbors, invite the kids over to play with your pup. Invite a friend over—one your dog doesn’t know. If your pup is shy around your friend, instruct your friend to sit down, sideways to the dog. Your friend shouldn’t look directly at the dog because dogs interpret this as threatening behavior. The friend should then extend his hand, which happens to be holding a tasty dog treat. The goal is for your pup to take the treat from your friend’s hand. Once your dog has taken a few treats and appears to be more confident, your friend can try to stroke the pup under her chin, a less threatening place than the top of the head. Repeat this process with different people in different parts of the house or outside. Teach your puppy obedience training commands, such as “Sit,” “Come,” “Stay” and “Heel.” This reinforces your leadership role and distracts your dog from being fearful. Learning skills and being rewarded for doing them helps your pup become more self-confident. Don’t coddle a dog who’s exhibiting shy and nervous behavior. You’re not a big “meanie” if you ignore a frightened dog. As long as you know your dog is safe, there’s no need to swoop her up and protect her. This type of coddling only reinforces her fearfulness. If you want to pet, cuddle and give a treat to your pup, do so after she displays positive behavior. Keep a close eye on your puppy when introducing her to new situations. If another dog bites yours, for example, it could cause lifelong emotional damage. Why Do Dogs Like to Have the Base of Their Tails Scratched?